We all know what a swizzle stick is — or at least think we do. It’s one of those colorful rods made of florescent plastic that bartenders put in some drinks because . . . because why? To stir it? The original swizzle sticks were cut from bushes and measured maybe a foot long. The root end of the stick was trimmed to form little “blades.” You would put it in a glass filled with crushed ice, booze, and mixers, and then quickly rotate the shaft of the stick between your palms so the root end would spin back and forth, churning your drink. This propeller action would help froth and chill the cocktail — no shaking necessary! The Bermuda Rum Swizzle is by far the best drink in the swizzle family, IMO. It’s a tall, delightful combination of rum and citrus. Refreshing and thirst quenching. Just the summer sipper you need for Labor Day weekend. The first swizzle drinks probably originated in Jamaica or one of the other Caribbean islands. 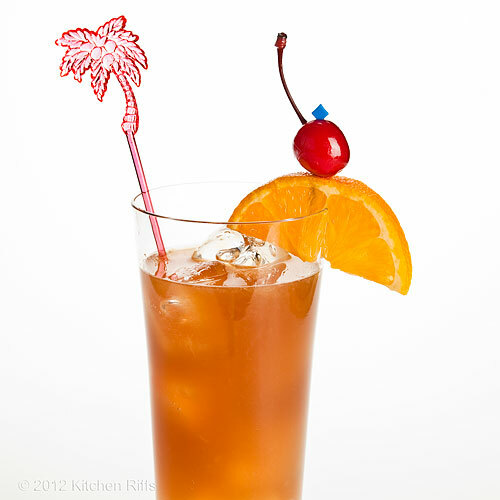 But over time, the rum swizzle became most associated with Bermuda. Some now call it Bermuda’s National Drink. Swizzles are really a form of sour — like a Whiskey Sour — because they’re nothing more than a mix of liquor, citrus, and sweetener. It’s the swizzling that sets them apart. Rum is the alcohol that you’ll find most often in a swizzle. But you can substitute any liquor you’d like. The original swizzles were made in pitchers, and were intended to serve a crowd. Today we usually mix up one or two at a time. And modern swizzle sticks lack the blades or fingers of the original, so they’re pretty useless for creating the frothing and chilling action that’s a hallmark of this drink. It’s much easier to shake. My favorite recipe for this cocktail is one I very slightly adapted from Robert Hess (who in turn credits the Gosling people — makers of Gosling’s Black Seal Bermuda rum). This recipe serves one, and takes about 5 minutes to prepare. Add all ingredients (except garnish) to a cocktail shaker half-filled with ice. Shake well and strain into a tall (10 - 12 ounce) glass filled with crushed ice or ice cubes. Garnish if you wish. I usually serve with long straws to make sipping easier. Hess’s version omits the Angostura bitters. I think the bitters add just a touch of spice that’s pleasant, but you may think otherwise. Most recipes for swizzles include bitters. 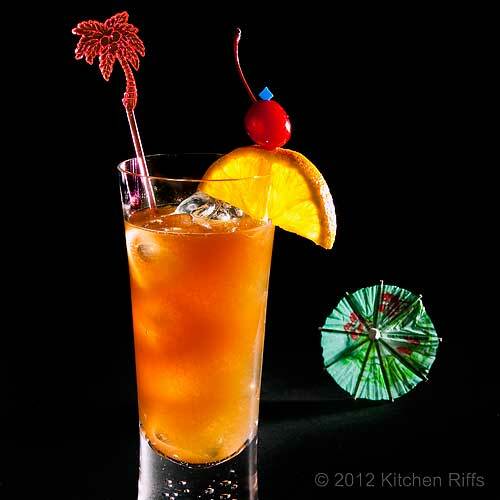 As discussed in our post on Planter’s Punch, falernum is a ginger- and lime-flavored syrup. Fee Brothers makes a very good commercial one, and it’s stocked at many liquor stores. Otherwise Amazon carries it (at a price). There really isn’t an adequate substitute for falernum, but Homemade Grenadine will kinda sorta work in this recipe. I’d start with 1/8 ounce grenadine, then adjust to taste. The Gosling folks have a recipe on their website for a swizzle that will serve six people. It requires 4 ounces of dark rum (they specify Gosling’s Black Seal, natch); 4 ounces gold rum (what a surprise, they suggest Gosling’s Gold Rum! ); 5 ounces pineapple juice; 5 ounces orange juice; 2 ounces falernum (or ¾ ounces grenadine); and 6 dashes Angostura bitters. Put ingredients in a pitcher half full of crushed ice, then churn vigorously until the mix is frothy and icy cold. What to use for churning? You’ll either have to cut your own swizzle stick or figure out something else — a wooden spoon, maybe? Or you could just invest in a large cocktail shaker. Strain into a cocktail (martini) glass and serve “up” — without ice. Mixing this drink in a pitcher (as the Gosling site suggests) is traditional. But serving it in a cocktail glass definitely is not, nor is serving it up. Still, it sounds like a pretty presentation. If you want to make a differently flavored swizzle, a pretty good formula is 4 parts liquor of your choice, 2 parts lime or lemon juice, 1 part sweet (I suggest Simple Syrup, but depending on the liquor you’re using you could also consider Homemade Grenadine, falernum, or another sweetener), and a dash or two of Angostura bitters. Thus you could make a Gin Swizzle, a Whiskey Swizzle, or a What-Have-You Swizzle. Of course, summer in the northern hemisphere doesn’t technically end until the third week of September. But at least for those of us in the US, Labor Day always seems to signal that summer is over and fall is on its way. We’ll still enjoy plenty of warm days for the next month or so, but cooler weather is definitely coming. And with that, a change in our eating habits. We’ll be seeing fewer main-course salads, more hearty soups. I grinned. “You’ve made your point that we need to have that one more often. But there’s room for other drinks, too. 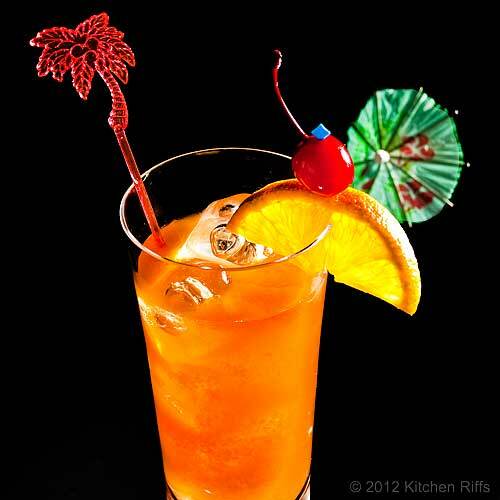 Like this Bermuda Rum Swizzle — isn’t it great? Next week we’ll finish out the Summer Sippin’ Series with a drink I’ll bet you haven’t had. And it’s named so appropriately for the last drink in the series: The Last Word Cocktail." Seriously. And it’s terrific. Look for it here on Kitchen Riffs after Labor Day. Are you going to start posting Fall and Winter cocktails? That would be awesome!!! Hi everydaymaven, before this summer I posted one cocktail post a month. Not very many, considering how many cocktails there are in the world! I'll have a bit more to say about my schedule for posting drinks next week, but short answer: in September and October, it won't be every week. Thanks for your comment. Based on swizzle sticks no less! Hi CCU, it's a great cocktail. Isn't the history of the swizzle stick interesting? I always enjoying learning new things. Thanks for your comment. Hi Chicago John, doesn't it look like it should be made in bulk? I like your kind of hospitality - I figure any guest worth his salt should figure out how to refreshing himself once he's shown where things are! Thanks for your comment. Hi Zoe, just as we here in the northern hemisphere are ending ours, you're looking forward to your warm weather! I'm happy for you - and I'm happy we're finally looking forward to some cooler temperatures! Thanks for your comment. I remember swizzle sticks - I'm old enough to remember them! When I was first old enough to drink, the way you could tell there was any liquor in the drink was that it had a swizzle stick. I had come of age! I can see me sitting outside under the palm tree, watching the boats go by and drinking a bermuda rum swizzle. I just need a stick! The info on the swizzle stick was very interesting. Summer never seems to last long enough. This Bermuda rum swizzle looks like it would be the perfect drink for summer. Hi Maureen, it's funny - this summer has been so hot I'm actually a bit glad to see summer go. Weird. I know you must be really ready for the warm weather - I'll be kicking myself in a few months. Anyway, this would be great for you to drink on your deck! Thanks for the comment. Hi Words of Deliciousness, wasn't the swizzle stuff fun? And summer is too short, as is every season (cold, snowy winter I could do without, however - that always seems too long!). Thanks for the comment. Hi Carolyn, a glass of water, a swizzle stick, and a slice of lime - you're go to go! You're right, though, that a swizzle stick makes any drink seem fancier. Thanks for your comment. One of the reasons that summer is so special is that it's so short. I love summer, but I'm also looking forward to Labor Day and the lovely weather of fall. Looking forward to the next installment in this series! Hi Beth, summer must be particularly short in Canada, I'd imagine. But overall, I think fall and spring have the weather I most prefer. Glad you're enjoying the Summer Sippin' Series! Thanks for your comment. Hi Hotly Spiced, swizzle sticks - and little cocktail umbrellas - both are cheerful little items, aren't they? They definitely make drinks even more festive. Happy for you that your warm weather is on the horizon! Thanks for your comment. those sticks do make the drink indeed! Hi Mariana, weird that your comment disappeared! Blogger has been acting up lately - some comments have being going over to the Spam inbox. However, every time I get a comment, I get an email notification - so if I don't see one where it should be, I always check my Spam filter. Anyway, this is a good drink for riding out the storm! We're expected to get some remnants of the hurricane too, which means lots of rain - something we really need. Thanks for the comment (and glad this one made it through!). I always learn something new here! Great history of the swizzle. Obviously you and Mrs. K have had a better summer than my husband and I had! LOL! Cheers, my friend. I think we are breaking out the rum this weekend! Hi Laura, I often learn something new when I write the posts! Although the tidbit of swizzle history I had actually read a couple of years ago - isn't cocktail history fun? Definitely break out the rum this weekend - have a wonderful Labor Day holiday! Thanks for the comment. Another rum drink - thanks so much. It was certainly interesting to hear about the origins of the swizzle stick. I guess you had to be careful about what plant you chose to use. Hi Suzanne, good point about be careful about which plant to use for your swizzle stick! Thanks for commenting. One of the things that I started exploring when I started my blog was trying out different hard liquors. I have discovered, after all of these years, that I love dark rum, so when I saw that this drink calls for dark rum and lime (a combination I love), I got excited. I will have to give this a try! There's a long weekend coming up. :) Have a great one! Hi MJ, dark rum has a fabulous flavor. 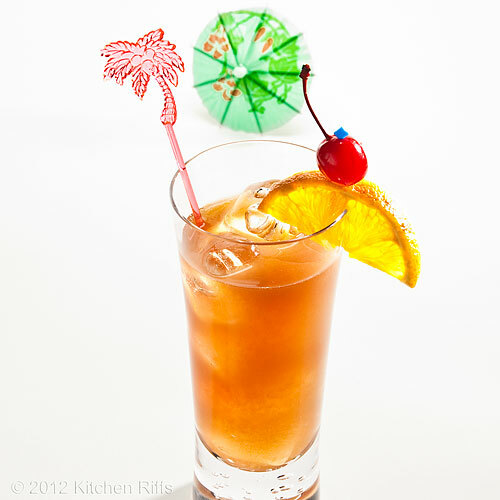 You might want to try a Mai Tai too - it requires dark rum and amber, but it has a fabulous flavor. I'll definitely be having a great weekend, and it sounds like you will be too (I hope so!). Thanks for the comment. This looks fantastic! I love all you drink recipes, now I need to try one of them out, and soon! Lovely, as always. I learned something new! I now know what a swizzle is. I love whiskey sours, so if this is similar I am sure I would love it too. Have a wonderful Labor Day weekend! As a kid I used to collect swizzle sticks... A wonderful cocktail. I wish I had a great collection of liquor bottles at home in order to concoct beautiful drinks like you do. Hi Cathleen, lol! This is really a lovely drink, well worth trying. Smooth, easy drinking, flavorful - sounds good to me! Thanks for your comment. Hi Kristi, the pineapple juice and OJ make this a bit sweeter than a whiskey sour but it's still basically a sour. You'll like it. I will have a nice holiday weekend - you too! Thanks for the comment. Hi Rosa, we really have ended up with a pretty sizable collection of liquor bottles, but we got them all one at a time - to try a new drink, or whatever. It actually took awhile to acquire what we have. But it's nice, because now whenever we want to try a new drink, we probably have the ingredients! Thanks for your comment. Beautiful and stunning looking cocktail!!! That swizzle stick... Absolute cutie!!! Hi Asmita, it's great! Totally refreshing, too. Thanks for your comment. Hi Reem, there are so many cool swizzle sticks you can buy! Fun to look at, even though they aren't quite as functional as the originals. Thanks for your comment. See, not only we get good drink recipes, we also get the history lessons. To be honest, I didn't know about the Swizzle Stick until now. I would rather show a bit of my ignorance here at your site than other site where they may not as tolerant. Haha! Thank you, John and have a great and safe long Labor Day weekend! Hi Ray, one can drink only so many cocktails, so I often just read about them rather then drink them. And heck, I embrace ignorance here - I have so much myself! It's only through recognizing one is ignorant that one learns anything. Thanks for the Labor Day wishes, and you have a great weekend too. And thanks for the comment. Riffies, summer is a never ending cycle here in Singapore. As a matter of fact, its either humid hot or humid rain. Yes. That is my excuse for the messy afro and my balding spot. I believe cold cocktails like this would help me get through sleepless nights. And i love the Pina Colada too. However, due to humidity, I'm bad at making drinks. I promise to shorten my comments if served with 10 of your summer sippins. Hi Pencil Kitchen, 10 of the drinks from my Summer Sippin' Series and you'd sleep well, humidity or no humidity! And I guess I knew that it was usually humid in Singapore, but I didn't realize it was 24/7 - not a climate I'd handle well (although I lived for quite a spell in Florida, where half the year it's humid 24/7). Thanks for your comment. That was a fun little fact about swizzle sticks! I didn't know how it's called in English but now I know. It's supposed to be very warm this weekend here (but now freezing 50F). I noticed that I always visit you on Fridays as if I come to drink your gorgeous cocktails! Oh yum now this sounds as food as a piña colada to me. I may have to try making this. As always your photos blow me away. Every time I visit your blog, I add another cocktail to the growing list to make when summer is here...love the photos and the swizzle stick history! Hi Nami, don't you love little facts like that? So much fun to learn new things! Hope your weather warms up so you can enjoy one of these this weekend! Thanks for your comment. Hi Vicki, it's a fun cocktail to drink - I hope you'll enjoy it. Thanks for your kind words, and your comment. Hi Jenny, don't worry, it'll soon be summer where you. So soon you'll be able to enjoy all of the drinks in the Summer Sippin' Series! Thanks for the kind words, and the comment. I visited Bermuda several years ago and immediately fell for Gosling's black rum and Rum Swizzles! I'd love for a few of these cocktails to be part of my Labor Day weekend. Hi Lisa, I must admit Gosling's Black Seal is one of my favorite dark rums (I like Meyer's a lot, too). And isn't the swizzle just a nice drink? I definitely think you should have one this weekend! Thanks for your comment. Hi Baker Street, 1 PM is a great time for one of these! Enjoy. ;-) Thanks for your comment. Hi Raymund, yup, as summer is about to leave in the Northern Hemisphere, it's getting ready to make its appearance in the Southern! This is a good drink any time, but I admit it's better in warm weather. Thanks for the comment. This sounds so great. I could really go for a tropical drink right now - it is still hot hot hot over here. I need to get my hands on some falernum, that flavor combo sounds right up my alley. Hi Katherine, falernum is really good stuff. If you Google it, there are recipes for making your own - but in this case it's probably easier to buy it (although knowing me, someday I'll make my own!). Thanks for your comment.